Paul Richardson of Alton says volunteering with UNH's Lakes Lay Monitoring Program is a great way to help protect the state's valuable freshwater lakes — and to give back to UNH. It’s a good bet that the kids romping around Ellacoya State Park, the owner of a $49 million lakeside estate and even The Tonight Show’s Jimmy Fallon share something in common when it comes to what they admire about Lake Winnipesaukee. In fact, it’s what draws people from around the globe to New Hampshire’s largest lake. It's the big lake's clean, pristine water. And they can thank a small army of volunteers like Paul Richardson for it. Once each week, from spring “ice-out” until late fall, Richardson fires up his Cobalt powerboat, motors out to the same spot on Alton Bay and performs what amounts to a check-up on the lake’s health. With an array of simple handheld instruments, Richardson gathers information on water clarity, temperature and local conditions. A few water samples get bottled up, too. And all of this gets passed along to UNH faculty and student researchers, who study it for subtle clues that can reveal looming challenges to the lake’s water quality. Multiply Richardson by more than 1,200 volunteers who have been trained by UNH’s Lakes Lay Monitoring Program (LLMP) and then multiply that by the thousands of tests performed at more than 100 lakes in New Hampshire – and you have one of the most powerful, vibrant environmental stewardship networks in the nation. As a 2014 winner of the W.K. Kellogg Foundation Engagement Scholarship Award, the program is one of four national finalists for the C. Peter Magrath University Community Engagement Award, which will be awarded next week at the Association of Public and Land-Grant Universities annual meeting in Florida. Started in the 1970s as a UNH student project on Chocorua Lake, the partnership now brings together UNH research faculty, UNH Cooperative Extension specialists and students, the UNH Center for Freshwater Biology and local volunteers, lake associations and communities in a program that has proven critical to safeguarding the state’s famous lakes and valuable freshwater resources. To date, the LLMP has also inspired or assisted similar citizen-scientist partnerships in 24 states and 11 countries. He can also tell you which lakeside vacation properties have been around for decades, which areas of shoreline are conserved, which have been developed and even which mountain peaks jut into the skyline many miles to the north. It’s easy to be distracted by such beauty as Richardson motors out from his dock. But Richardson, a retired engineer in the defense industry, is all business once he anchors his boat at the Alton Bay monitoring site. 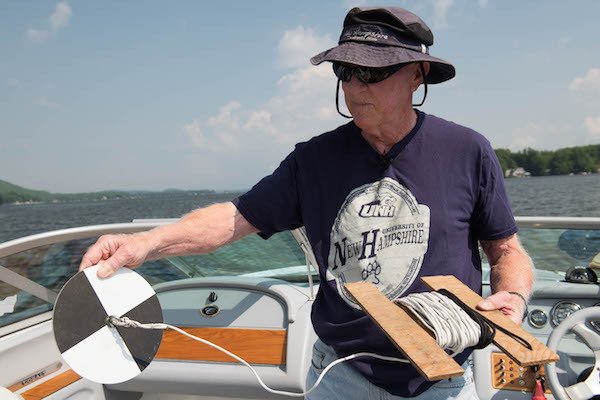 In one simple test, Richardson lowers a black and white metal disk about the size of a dinner plate, called a “Secchi disk,” over the side with a sturdy rope and peers down into the water, carefully recording the depth at the point it disappears from view. The distance gives a measure of water clarity, and an idea of the amount of suspended sediment that can cloud the water. On a typical day last summer, he could easily see the disk more than 30 feet below the surface. And that’s a good thing, not simply because clear water is more appealing to the eye, but because suspended particles can be a sign of polluting run-off from any number of sources, from lakeside construction to faulty storm drains to failing septic systems. Water samples are also tested at UNH for levels of dissolved oxygen, algae, chlorophyll, phosphorus, acidity and other factors – and unexpected changes in each can offer telltale signs about water quality threats. Thankfully, Richardson says, the LLMP leaves the most technical aspects of water sample testing to faculty and staff at the UNH Center for Freshwater Biology. Jeff Schloss is co-director of the LLMP and a program leader for natural resources at UNH Cooperative Extension. In the simplest terms, he says, New Hampshire could not ever monitor its freshwater quality as well or as extensively without volunteers like Richardson. Schloss notes that most lake monitors also become more involved in their communities once they volunteer with LLMP, and their perspectives and water quality data are highly valued in informing local lake protection efforts. The results have been used to make the case for local sewage treatment projects, create rules regarding shoreline development and help communities qualify for grants that support water quality related projects. Huddleston expects that the LLMP model will become increasingly important around the globe as issues related to scarce clean freshwater resources mount. “If I had to predict an issue for the rest of this century that will probably dominate discussion not just in America but around the world, it will be water,” Huddleston says. "And the kind of work our Lakes Lay Monitoring Program does here in New Hampshire is an important part of that dialogue, because it's about protecting a resource that's about more than just boating and fishing and swimming. It's about our ability to maintain our very existence on this planet."